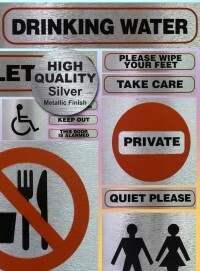 Classic Sign is the UK’s leading manufacturer of self-adhesive stickers for use in homes and businesses. 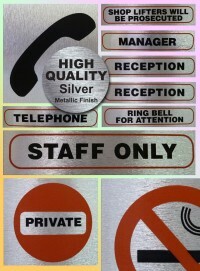 Our range of information signs is one of the largest on the market and our Pet Information Signs are unmatched in their range and quality. 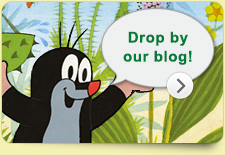 Choose from our extensive options for information and warnings about dogs, cats and even kids! 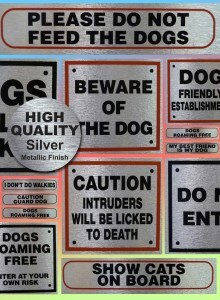 Pet Information Signs are both frivolous and more serious, and whatever you are looking for we are sure you will find something here to suit your needs. 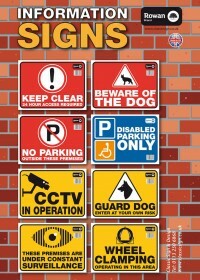 Click on the tab above to view the full list, including information signs such as Caution guard dogs, Dogs in transit, Cats in transit, Please do not feed the animals, Watch out dogs about, Show cats on board, Show dogs on board, Warning do not tease the dog, Please close the gate, Dog on board, Guide dogs only, Keep out dogs, Beware of the dog and Canine caution. 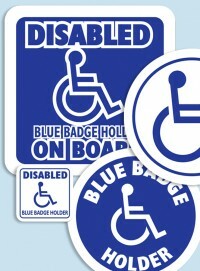 There are plenty of tongue-in-cheek options, ideal for use in the family home. Choose from Get a life get a dog, Dogs have masters cats have staff, Dog friendly home, Never mind the dogs beware of the kids, I don’t do fetch and carry, Caution intruders will be licked to death, My best friend is my dog, I don’t do walkies, The dog and its house-keeping staff life here and many, many more! 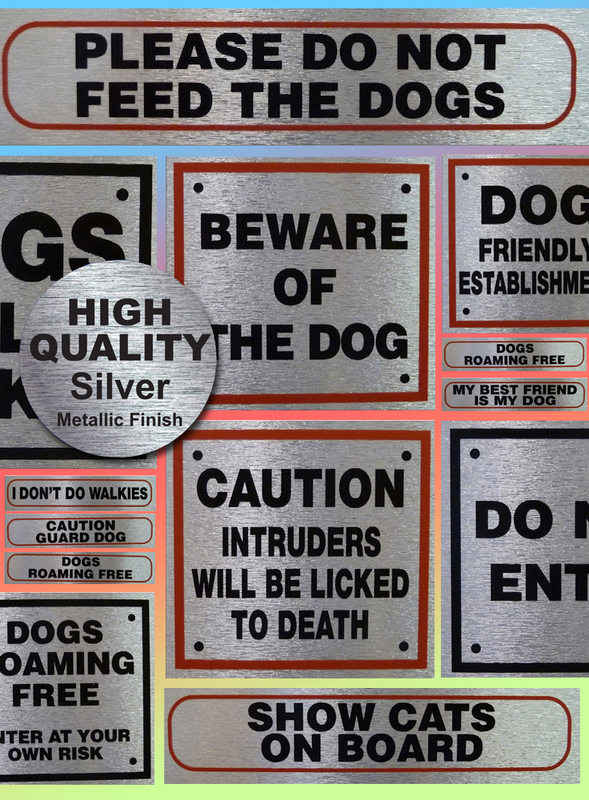 All our Pet Information Signs are made from self-adhesive vinyl with a high-quality metallic finish, making them both eye catching and durable.